To access all past reports in PDF format, click here. 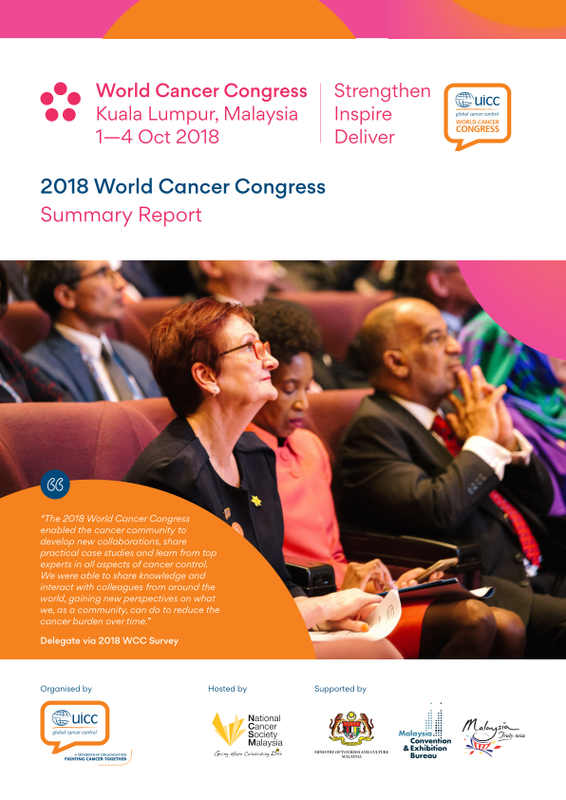 250 leaders and executives from cancer organisations, UN agencies, Ministries of Health, academia and the private sector positively responded to the call for ‘Effective International Collaboration’, prompted by the 2015 World Cancer Leaders’ Summit which took place on 17-18 November in Istanbul. A UICC Partners Day also complemented this year’s Summit, opening up the dialogue on ways to improve collaboration through public private partnerships with a series of interactive sessions ran by UICC partners and members. On the Summit Day 18 Nov, Mr Gary Cohen, Executive Vice President, Global Health & Development, Becton, Dickinson & Co., outlined the shared value model which leads companies to include community needs as part of their business objectives, with the aim to create substantive impact. Dr Sania Nishtar, Founder and President, Heartfile and former Federal Minister of Health for Pakistan, explained why the effective management of conflict of interest is the basis of implementing great collaboration and partnership. The afternoon shined a light on successful concerted approaches to deliver national cancer control planning, childhood cancer integration in health and primary care services and effective national NCD alliances. Case studies on managing conflict of interest and on overcoming the challenges in data sharing and in working effectively with a variety of partners also provided key learnings for the Summit participants. The day ended with Mr Hübel from the EU Commission who highlighted the EU actions to tackle cancer and to support the Members States in reducing the cancer incidence by 15% by 2020. 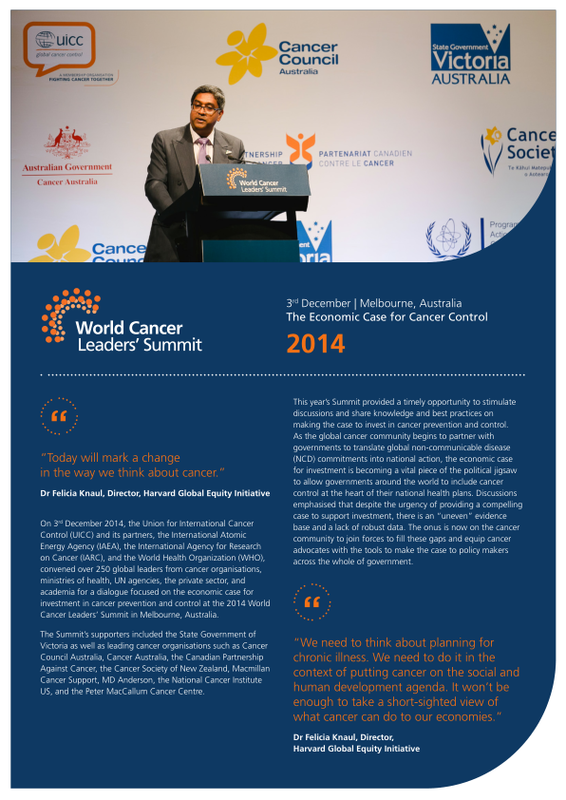 The 2014 World Cancer Leaders’ Summit was held on 3rd December 2014 in Melbourne, Australia in partnership with the International Agency for Research on Cancer (IARC), the International Atomic Energy Agency (IAEA) and the World Health Organization (WHO). 250 leaders and influential global players joined the event which focused on 'The Economic Case for Cancer Control' . Too often, cancer is perceived to be a significant cost, whilst the economic and social benefits of addressing the disease are poorly understood and recognised. 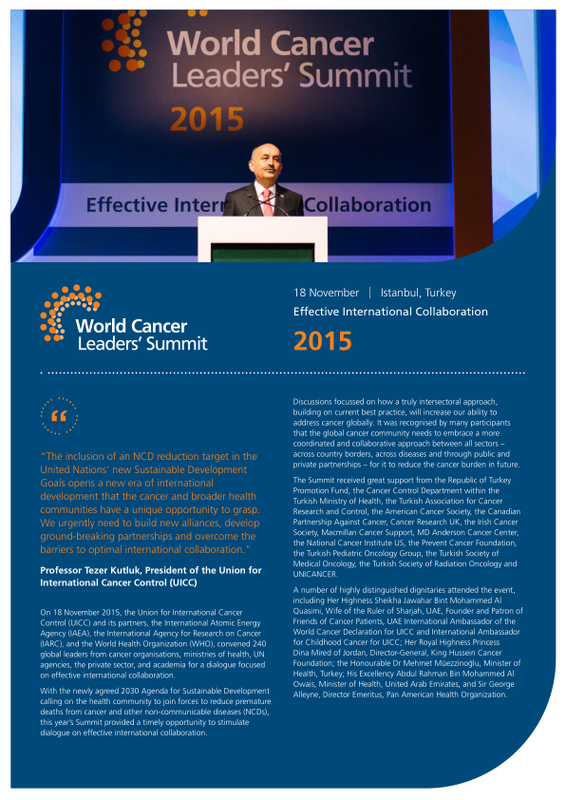 To complement the Summit, UICC launched a new publication on the topic. The Summit offered an opportunity to share understandings of cost effective national cancer control planning and how we can more effectively address a disease which is affecting all countries in unique ways. The event began with keynote speeches and was followed by breakout sessions on topics such as tobacco control, screening, radiotherapy, and more. It concluded with the launch of a report entitled 'The Case for Accelerating Action'. It is our pleasure to share the very first World Cancer Leaders’ Summit booklet, dedicated to ‘The Economics of Cancer Prevention and Control’! 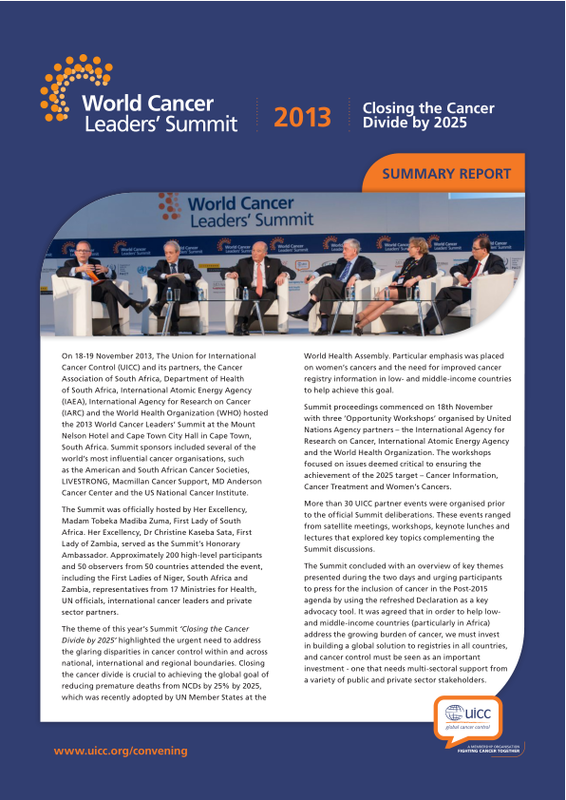 The 2013 World Cancer Leaders’ Summit was held on 18-19 November 2013 in Cape Town, South Africa, in partnership with Cancer Association of South Africa, the Department of Health of South Africa, the International Agency for Research on Cancer (IARC), the International Atomic Energy Agency (IAEA) and the World Health Organization (WHO). We had the honour of being hosted by Her Excellency Madam Tobeka Madiba Zuma. Approximately 175 high-level participants attended the event. The theme of the Summit* was ‘Closing the Cancer Divide by 2025’ and outlined the urgent need to address the glaring disparities in cancer control within and across national, international and regional boundaries. Closing the cancer divide is crucial to achieve the global goal of reducing premature deaths from NCDs by 25% by 2025, which was adopted by UN Member States at the World Health Assembly in May 2013. 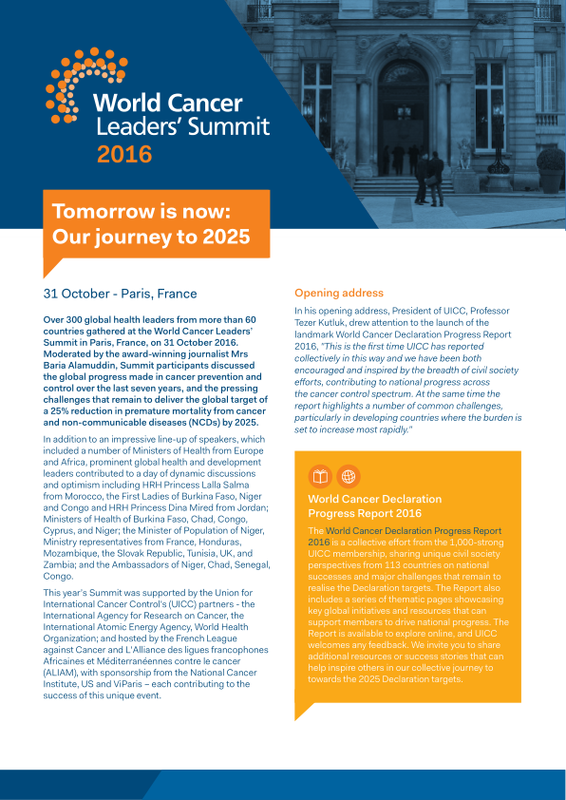 The Summit Programme began on Monday, 18th November, featuring three Opportunity Workshops facilitated by WHO, IARC and IAEA. UICC and its partners also hosted a number events on themes related to the Summit. Summit participants convened the next day for morning keynotes and panel discussions, followed by an afternoon ‘Big Debate’ session. An updated version of the World Cancer Declaration was launched which will be used by cancer organisations around the world to press for the inclusion of cancer in the Post 2015 consultations taking place in the coming two years. *The theme of the Summit was inspired by the GTFCCC publication "Closing the Cancer Divide: An Equity Imperative" (2012) published by the Harvard Global Equity Initiative with Harvard University Press. American Cancer Society, IAEA/PACT Programme, Livestrong Foundation, MacMillan UK, MD Anderson and US National Cancer Institute. 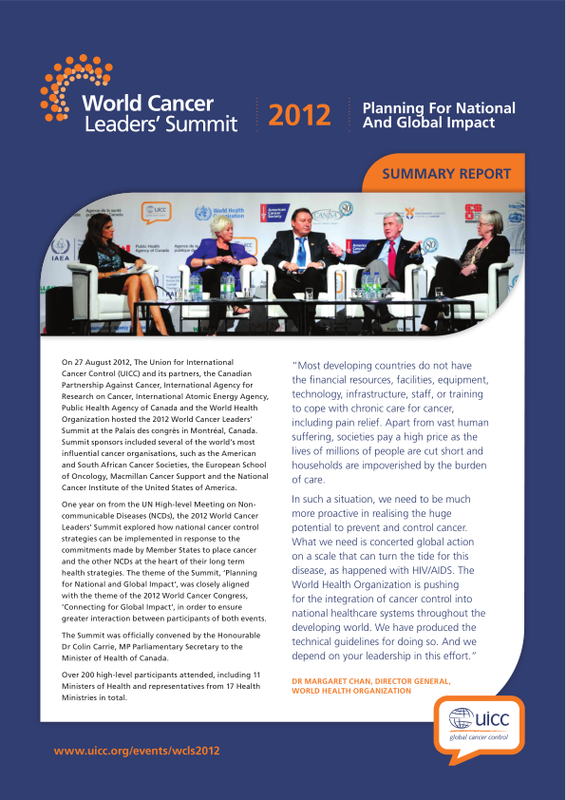 The 2012 World Cancer Leaders’ Summit was held on August 27th, in Montréal, Canada, in conjunction with the World Cancer Congress. One year on from the UN High-level Meeting on NCDs, the 2012 Summit agenda was designed to consider how national cancer control strategies can be implemented in response to the commitments made by Member States to place cancer and the other NCDs at the heart of their long term health strategies. The theme of the 2012 Summit, 'Planning for National and Global Impact', is closely aligned with the theme of the 2012 World Cancer Congress, 'Connecting for Global Impact', as it is our intention to ensure there is great interaction between participants. 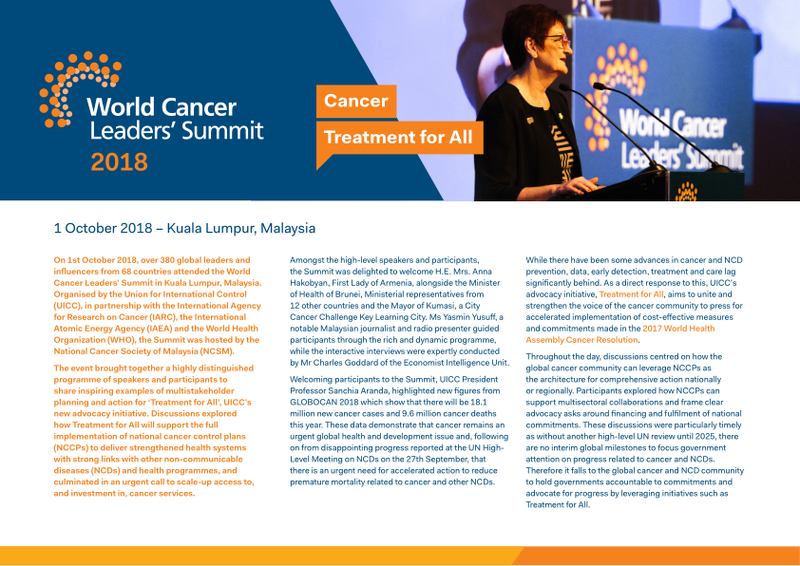 The Summit panels included ample debate and analysis from a range of key stakeholders, including international cancer leaders, UN officials and Ministers of Health.